Stars: Jamie Foxx, Rose Byrne, Quvenzhane Wallis, Cameron Diaz, Bobby Cannavale, Adewale Akinnuoye-Agbaje, David Zayas, Zoe Margaret Colleti, Nicolette Pierini, Eden Duncan Smith, Amanda Troya, Dorian Missick, Tracie Thomas, Mike Birbiglia, Stephanie Kurtzuba. This new version of the feelgood hit play about the little orphan girl Annie searching for the parents who abandoned her is serviceable enough but probably unnecessary. The character was originally created for a comic strip by Harold Gray, but in the 70s Thomas Meehan turned the character into a musical for the stage. 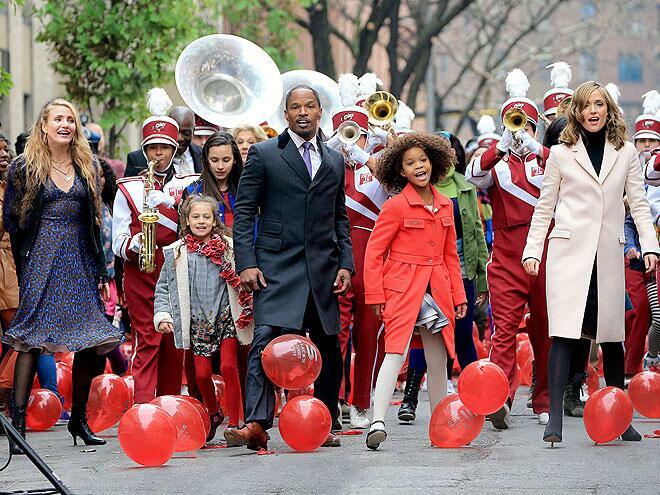 Annie ran on Broadway for six years, and won a Tony for Best Musical. Amongst the many girls who played the title character during its run was a young Sarah Jessica Parker. In 1982 Annie was brought to the screen with mixed success by Oscar winning director John Huston, and there was also a more faithful version made for television in 1999 by director Rob Marshall, who brought the musical Chicago to the screen. Written by Aline Brosh McKenna (romantic comedies like 27 Dresses, etc) this new version of the popular musical has updated it and set it in New York in the 21st century, giving the material a different vibe. This also means that many of the original songs written by Charles Strouse and Martin Charnin and dealing with Depression-era America are no longer relevant. They have been excised, and some new songs have been written by singer/songwriter Sia. Signature tunes like Tomorrow and It’s A Hard Knock Life remain, but the music here has been given more of an R&B flavour, due largely to the involvement of rappers like Jay Z and Will Smith as producers. In fact, Smith originally envisaged this remake as a starring vehicle for his daughter Willow. But with Willow being considered too old to play the heroine, the role eventually went to pint sized dynamo Quvenzhane Wallis, who broke through with her role in Beasts Of The Southern Wild, a performance that saw her become the youngest person to be nominated for a Best Actress Oscar. And Wallis brings plenty of energy and enthusiasm to her performance here as she sings and dances up a storm as the feisty, self-assured and eternally optimistic little orphan girl. Annie is living in a foster home run by the cruel, alcoholic Mrs Hannigan (Cameron Diaz), who collects $157 a week per child, but who has little interest in their welfare outside regular visits from bureaucrats. Annie always dreams of finding the parents who abandoned her outside an Italian restaurant, with a note saying that they would return and find her one day. But one day while trying to rescue a dog from being tormented by a couple of street thugs, she literally runs into Willie Stacks (Jamie Foxx), the crusty billionaire CEO of a huge multinational cell phone company, who saves her from being hit by a car. Stacks is campaigning for mayor, but he is lagging in the polls until vision of him rescuing Annie goes viral. Stacks’ shrewd and manipulative campaign advisor Guy (Bobby Cannavale) sees an opportunity, and convinces Stacks to have Annie move into his palatial penthouse apartment. Before long, Stacks’ approval ratings are sky high. Stacks is initially a cold, heartless workaholic, until Annie’s presence begins to soften his nature and he becomes a more sympathetic and genuinely caring person. The director is Will Gluck, who is better known for comedies like Easy A and Friends With Benefits, and he seems a little uncomfortable with the demands of the musical genre. He tries to inject some energy into the song and dance numbers. And he opens up the material beyond its stage origins by taking the action into the streets of New York, making the city itself a character in the film. Wallis is resilient, confident and brings a sassy quality to her performance. She has a charming and endearing presence in the title role. Foxx and Wallis develop a great rapport and chemistry here that enlivens their shared scenes and brings some heart to the material. Australia’s Rose Byrne is great and shows another side to her talents, singing and dancing her way through her role as Grace, Stack’s faithful and loyal secretary who falls in love with the feisty Annie at first sight. Audiences can see her obvious affection for Annie, but they can also sense her strong feelings for Stacks. Diaz is wonderfully over the top as the cruel and bitter Hannigan (a role originally played by Carol Burnett), who actually proves to have a heart of gold underneath her cold exterior. Cannavale is suitably slimy as the scheming Guy, who is prepared to do just about anything to ensure Stacks has a positive media image and wins the mayoral race. In a nice touch, Stack’s opponent in the mayoral race is named Harold Gray, an obvious homage to the creator of the character. Stephanie Kurtzuba (from The Wolf Of Wall Street, etc) brings some wonderful touches of humour to the material through her small role as Mrs Kovacevic from Human Services. David Zayas and Adewale Akinnuoye-Agbaje bring some warmth and compassion to their smaller roles. While few of the songs here are truly memorable, this remake of Annie is a family friendly musical that will probably send many out of the cinemas with a smile on their face and a spring in their step.